This year is one filled to the brim with creativity and passion for the arts. The visual artists, especially, have been given unprecedented freedom over the type, theme, and topic of their pieces—embedding an even more poignant personal touch to their craft. A lot of the grads are working on their portfolio, as presented by the recent art slideshow; the quality and ardor of the pieces are at paramount. Feeding off this enthusiastic atmosphere, the tangible representation of these efforts would be more closely displayed in the oncoming art displays. The diverse use of: colors, mediums, contrast, and techniques flourish through each piece that rests in the art studio. Pertaining to the recent show of progress, much can be expected for the caliber and avidity of these works. On Wednesday, December 2nd Collingwood’s Visual Arts Department, headed by Mr. Francis and his wonderful team including Ms. Spencer, Ms. Geddes and Ms. Walsh, hosted its inaugural Grade 12 “Gradual Exit” art show. 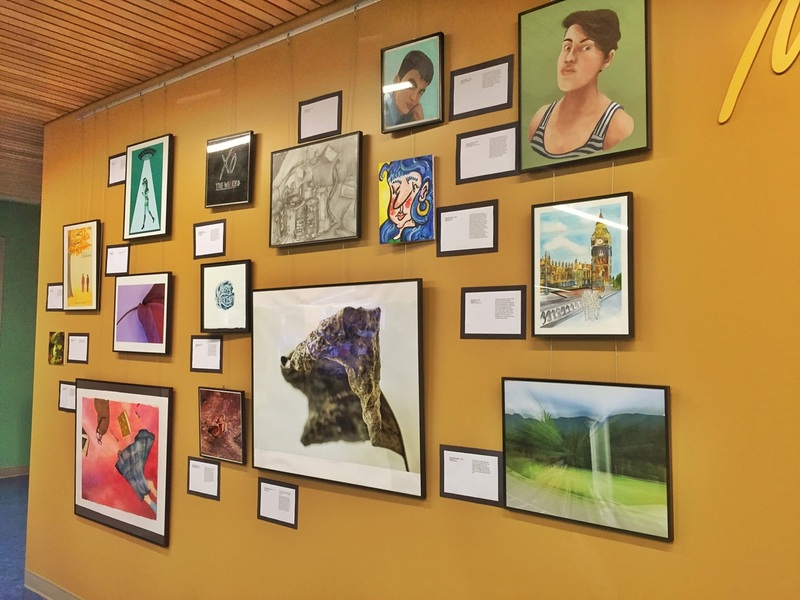 The exhibition showcased an incredible diversity of subject matter and contrast of both artistic styles and mediums from current Grade 12 art students. The exhibition included graphic design pieces from illustrator, self-portraiture, oil canvas painting, watercolour, acrylic on canvas, as well as macro-lens and black and white photography. Mr. Francis congratulated the students on their artistic endeavours and creative risk taking and recognized their willingness to experiment and adapt their work as they progressed to create their final art piece. It was wonderful to see so many parents and faculty come out and support the Grade 12 artists and see that the “Arts” at Collingwood is thriving. The exhibition took place in the McLaughlin Grad Lounge, which showcased the artwork beautifully. Many thanks to the Art Committee and all the teachers and students who helped set up the art display. Mr. Francis asked for a round of applause for the students as well as the art department for all their efforts in the Gradual Exit Exhibition. Headmaster, Mr. Wright complimented Mr. Francis for his incredible leadership of his department and for spearheading this show. If you were unable to attend this delightful event, there will be more exhibitions of the Grade 12 students’ artwork as the year unfolds. Please enjoy the photos below of this wonderful event.